French Foreign Minister reminds senate that President Hollande promised to promote recognition of a Palestinian state. France is considering voting in favor of the Palestinian Authority’s unilateral statehood bid at the United Nations, its foreign minister hinted on Thursday. 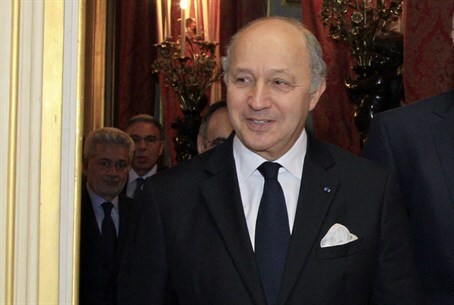 Speaking at a hearing in the French senate, Foreign Minister Laurent Fabius reminded that French President Francois Hollande promised during his election campaign to promote the issue of Palestinian statehood. "I would like to mention that in his election campaign, President Hollande said he would work toward international recognition of a Palestinian state," Fabius said. While he did not specifically say how France would vote when the PA submits its request, a French government official said Fabius’ remarks are a hint that France would support the PA’s request for recognition as a non-member observer state. Earlier this week, British Foreign Secretary William Hague called Abbas to back off from his plans to ask for UN recognition, saying, "While there is any chance of achieving a return to talks in the coming months, we continue to advise President Abbas against attempts to win Palestinian observer state status. "We judge that this would make it harder to secure a return to negotiations, and could have very serious consequences for the Palestinian Authority," Hague told the British parliament. Channel 10 reported that the international community is trying to come up with a compromise which would allow Abbas, on the one hand, to return from New York to Ramallah with UN recognition, but at the same time would prevent him to file lawsuits against Israel in the International Criminal Court. Abbas recently announced that the PA will present its bid for non-state UN membership on November 29. That date was chosen on purpose, as it is the anniversary of the day in 1947 in which the United Nations voted in favor of the partition plan. The resolution recommended the creation of two states, one Arab, one Jewish and granted a small portion of the area, under the British Mandate, to the new Jewish state. U.S. President Barack Obama has announced that he opposes the PA bid and asked Abbas not to go through with it. However, Abbas responded to Obama with a direct “no”. The agreement commits the PA to negotiate with Israel for the establishment of an independent PA entity. Lieberman, meanwhile, insisted on Thursday that Israel would not back down and would sanction Abbas if he goes ahead with his bid.